The iMainGo 2 is a risky one for me, I have seen so many speakers that are just outright awful and have learnt that the more you pay for a speaker the better the sound quality and performance of it is. So the iMainGo 2 would prove my whole theory wrong if it was any good retailing at just $39.99. When I first held the speaker I knew instantly the build of it was superb. If you drop this with your iPhone in there is no need to worry. The fabrics and plastics used are not cheap and everything comes together to produce a feeling of a very good sturdy case. I opened the unit up by unzipping it along the sides. Inside was fully padded and again everything felt sturdy. I was very impressed with how you place your iPod and iPhone inside the iMainGo 2. You simply un-velcro a strap which leads you to removable foam padding and a plastic piece supporting it on top. 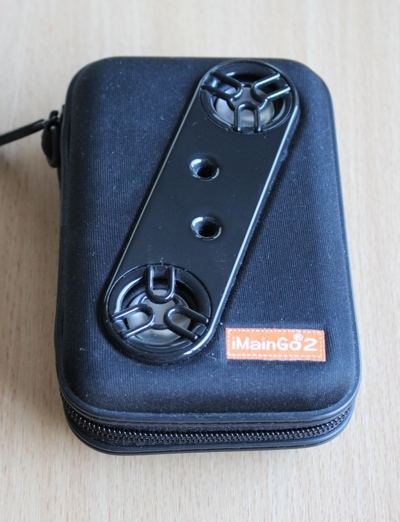 This design is genius, it means you can place pretty much any portable device inside the iMainGo. Once your device is sitting inside nice and snug you can input an audio jack into it and again this makes the iMainGo universally accessible because every phone and iPod has an audio jack so everything works with the iMainGo. However I would have preferred an iPod 30 pin connector as an option, that is something I am hoping to be added within future versions of the iMainGo. Once I had done everything up and turned the iMainGo 2 on (it comes with 4 batteries within the box) I could use my iPhone and iPod’s with the ‘trap door’ as I like to call it in the back of the device. It’s kind of like the iMainGo has it’s own screen protector built in, which means you can use all of the multi touch controls on your iPhone while in the case and this is great for playing games. I began testing the audio quality with different genres of music to see how they all performed and I was truly blown away. This thing has better sound quality than many $200-$300 speaker docks and this is designed to be portable. The bass is fantastic and it actually has a separate bass from the two individual speakers which was very nice to see. I have no idea how they created these speakers to output so much volume at an amazing quality. These things are tiny and I mean tiny and they play music as if it was a giant speaker sitting on the floor. So as you would expect the iMainGo must vibrate and give a lot of reverb, no not at all and this must be down to the great build of the device. It’s so well put together that nothing will upset it however loud the sound is. I now use my iMainGo 2 for watching all video content on my iPod’s and iPhone (it’s perfect for YouTube), of course all of my music is now played through this and I use it to listen to the radio from my ‘Tunein Radio App’. The best part of it is if a friend or family member wants to here a new sample of a track on iTunes or a YouTube video, I just casually pull out my iPhone within the iMainGo 2 and don’t tell them that the sound quality is absolutely amazing and let them discover it for themselves. Ahh that feels good. What I would love to see in the nest iMainGo is an iPod 30 pin connector and more colors of the device. Overall the iMainGo 2 is the best iPhone and iPod portable speaker you can buy and it’s also a protective case. If you enjoy your audio and would like a headphone less solution you have to get the ‘iMainGo 2’.